The recent collision of two satellites in orbit represents a pretty serious problem for proponents of spaceflight. Some scientists are discussing ways of cleaning up the increasing amounts of debris in earth orbit. They’re worried that more and more junk flying around up there will make it difficult for humanity to reliably operate satellites or manned vehicles. 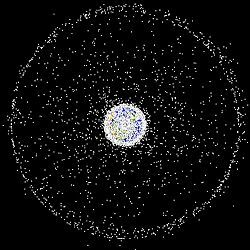 Trash in orbit isn’t a new issue – it came up a couple years ago as a result of the Chinese test to shoot down a satellite, though the debris concern was somewhat overshadowed by totally legitimate fears of the militarization of space. What scientists and spaceflight supporters hope to avoid is what’s called the Kessler Syndrome – a chain reaction set off by debris collisions that cause more debris and, therefore, more collisions. The result of this scenario is such a high risk of collision in orbit that it renders impossible many or all of the space-based activities that we currently take for granted. NASA’s on the case, though, with their Orbital Debris Program Office at the Johnson Space Center. 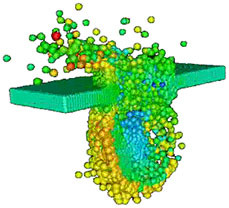 The coolest thing on their site is a link to the facility where orbital debris collisions are modeled – the Hypervelocity Impact Technology Facility. They use high-speed cameras, light gas guns and computer simulations (with video!) to explore how collisions at orbital velocity (kilometers per second) will effect various shielding materials. The European Space Agency is also taking a serious look at the space debris problem. Watch a video showing the build-up of orbital debris over the last 50 years on their Space Debris Spotlight page and check out their own work on hypervelocity impacts on the space debris section of their website.